Making interstellar travel a reality within the next century or two will require the continued and methodical development of a range of advanced propulsion technologies, as it's unclear at this stage which ones will eventually pan out, said Marc Millis, the former head of NASA's Breakthrough Propulsion Physics Project. Interstellar spaceflight is not feasible with ordinary chemical rockets; the distances are far too great. The extrasolar system nearest to us, for example, is the three-star Alpha Centauri, which lies about 4.3 light-years away, or more than 25 trillion miles (40 trillion kilometers). It would take a traditionally powered spacecraft about 40,000 years to cover that distance if the vessel launched today, scientists say. 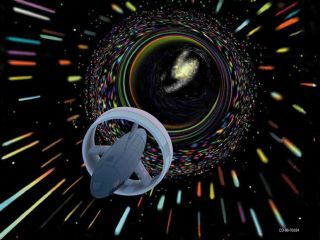 So researchers are investigating a number of new and advanced propulsion technologies, including nuclear fusion rockets, matter-antimatter engines, light-catching solar sails and spacetime-bending "warp drives" that could theoretically enable faster-than-light travel. Millis thus advocates "a reasonable portfolio, a small amount spread over everything from the seemingly simple solar sails to the seemingly impossible faster-than-light [engines], and the things in between," he told SPACE.com. Research in these areas should proceed on a step-by-step basis, aiming to knock off a series of achievable milestones to build momentum and, hopefully, attract more funding, which is decidedly scarce at present, Millis added. "By proving that you can actually make progress now — and demonstrate how much progress you can make for how little bucks — you might be able to interest a few people into upping the ante on that a little bit," he said. Millis prefers this course of action over dreaming up big, ambitious plans and then hoping that large amounts of funding somehow materialize. "That [approach] hasn't been working for at least a half century," Millis said. Millis isn't the only researcher trying to get the ball rolling toward interstellar flight right now. "An interstellar mission will be a pan-generational initiative requiring an immense investment of intellectual and financial capital, and so the necessary programs need to begin today," Richard Obousy, president and co-founder of the nonprofit group Icarus Interstellar, said in a statement recently. Icarus Interstellar is hosting a conference, called Starship Congress, this August in Dallas to discuss the possibilities and implications of interstellar flight. The meeting will have a practical bent, organizers say, examining what can be done on both short- and long-term timescales to pull off an interstellar mission. Not all of the work that needs to be done is technological. For example, there are ethical issues to consider when pondering journeys to other star systems, which may host their own native lifeforms. Politics and sociology come into play as well, Millis said, since any reasonably rapid interstellar journey would require mind-boggling amounts of energy. "You're talking about the kinds of energy levels that could, if used errantly, destroy the surface of the Earth," Millis said. "So at that point, you have to have a society that is mature enough to use its energy prowess wisely and for the common good, rather than throwing an impulsive punch and accidentally making bad things happen." Despite all the challenges posed by interstellar flight, both Obousy and Millis see reasons for optimism. "We haven't yet discovered an Earth-like planet yet, but, my gosh, when we do, that will probably be a motivation-getter," Millis said. The continuing advance of computer technology should also help, Millis said, citing the coming "singularity" — when the processing power of machines far exceeds the combined brainpower of all humanity, predicted by famed futurist Ray Kurzweil to occur in 2045 — as another potential milestone. The rise of commercial spaceflight and the nascent asteroid-mining industry should also play a role, by helping humanity expand its footprint out into space to tap into the vast resources of the solar system. "A solar-system-wide economy could kickstart research and development of the technologies that will allow us to engage in interstellar flight," Obousy told SPACE.com earlier this year. The combination of all of these factors may make it possible for humanity to launch its first interstellar mission by the end of the century, he said. "I think a lot of people tend to overestimate what we can accomplish in the short term, in the next five to 10 years," Obousy said. "But they also vastly underestimate what we can accomplish in the long term, decades or a century from now."